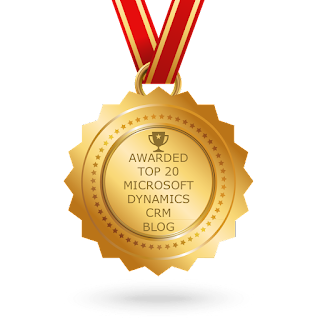 Recently my blog has been awarded "top 20 Dynamics 365/CRM blogs in the world 2018". Many thanks for Feedspot team for recognizing my efforts in helping the Microsoft Dynamics 365/CRM Community in the form of blogging and other social medium channels. Once again i am very happy that this is the second year i am receiving the " top blogger award" from "Feedspot". Looking forward to helping the Microsoft Dynamics 365/CRM Community throughout my career.